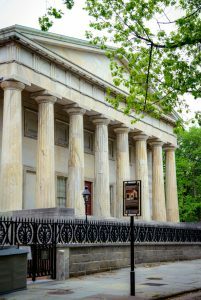 The Chestnut Street frontage of the Second Bank of the United States is an example of Greek Revival architecture, a style adopted for various public buildings in the early years of the United States in tribute to Greece's role as birthplace of Western civilization and incubator of democracy. That history also compelled many prominent Philadelphians to support the Greek war for independence. In 2017, the building on Chestnut between Fourth and Fifth Streets housed a portrait gallery of historic figures. Born in Dublin, Ireland, in 1760, Mathew Carey migrated to America in 1784. While in Ireland, Carey faced a backlash from the British Parliament over his writings on Irish nationalism and Catholic emancipation. 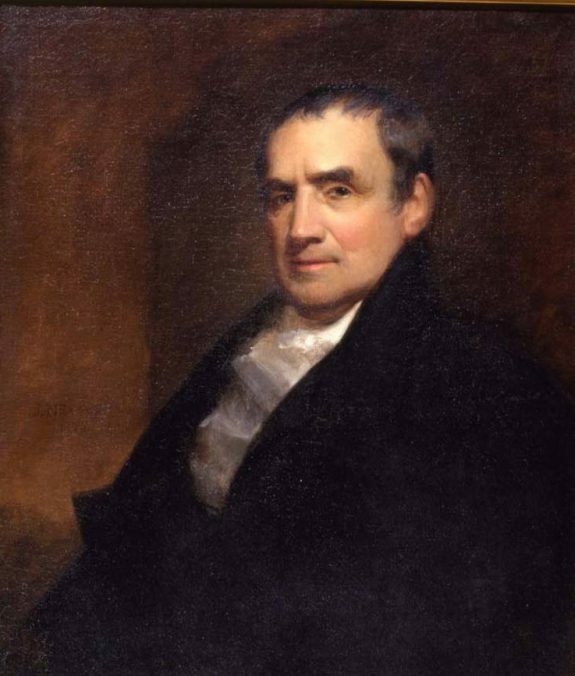 Given his own background, Carey found a strong bond with those fighting for freedom in Greece in the 1820s, and along with other prominent Philadelphians he formed a committee to assist those fighting for independence in Greece. Upon his arrival in Philadelphia, Carey began a promising career as a publisher and journalist. Along with his newspaper printing, he published Bibles, maps, novels, schoolbooks, and almanacs. Because the country lacked international copyright laws, Carey republished numerous British books for an American audience. His success as a publisher led to the creation of a book fair in 1801, alternating between Philadelphia and New York. Besides his publishing, Carey was active in many other disciplines. He belonged to the American Philosophical Society and the Franklin Institute, and established the Hibernian Society. By the 1820s Carey began slowly moving away from publishing and made a name for himself as an economist with essays on political economy and tariffs on imports. After an economic collapse that came to be known as the Panic of 1819, Carey helped to establish the Pennsylvania Society for the Promotion of Internal Improvements. Though he began his life in America fleeing political and religious persecution, Carey used his experiences to aid the cause of independence. After a seven-year battle, Greece gained independence from the Ottoman Empire in 1828. Many in Philadelphia felt a kinship between the city and Greece, separated by five thousand miles, because both locations had key roles in the history of democracy. 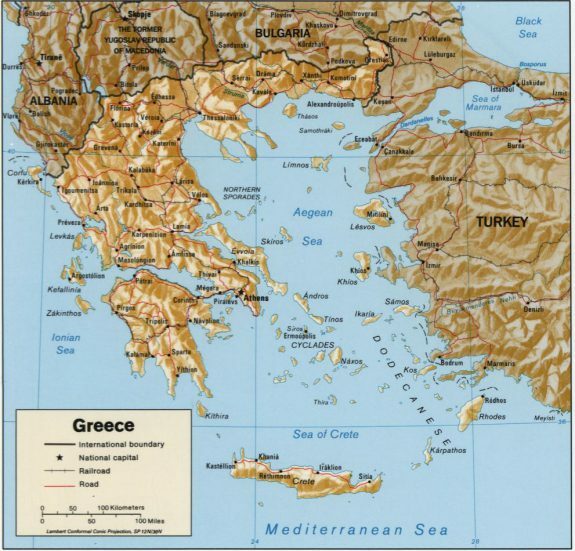 On this map, the lighter-brown areas show Greece after its independence, borders that remained in the early twenty-first century. In the 1820s during the war for Greek independence, the U.S. frigate Constitution was dispatched to aid Americans residing in Greece. Its duties included ensuring the safe passage of cargo ships. 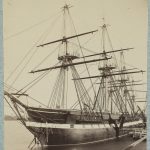 The naval ship, nicknamed Old Ironsides, was retired from active duty in 1881, but in the early twenty-first century remained popular as a museum ship based in Boston. During the Greek War for Independence (1821-28), when the Greeks of the Morea (Peloponessus) rose in rebellion after almost four centuries of Ottoman rule, Philadelphians helped to arouse public sentiment and sympathy in favor of the Greeks, raised money and provisions to aid the cause, and lobbied their representatives to recognize Hellenic independence. In Philadelphia and elsewhere in the United States, philhellenes (lovers of Greek culture) sought to convince the American public that Greece, as the birthplace of western civilization, deserved to be resurrected as a free and democratic state. And as the inheritors of this tradition of liberty, Americans had a duty to help Greece reclaim its birthright. Often styled the “Athens of America” for its cultural richness and taking its name from the Greek words for love (phileo) and brother (adelphos), Philadelphia proved to be well-suited to lend its moral and material support to the Greeks. 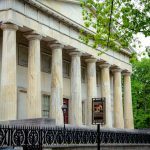 By the time of the Greek revolution, Philadelphia was in the midst of its own Hellenic renaissance with the building of the Second Bank of the United States between 1818 and 1824. 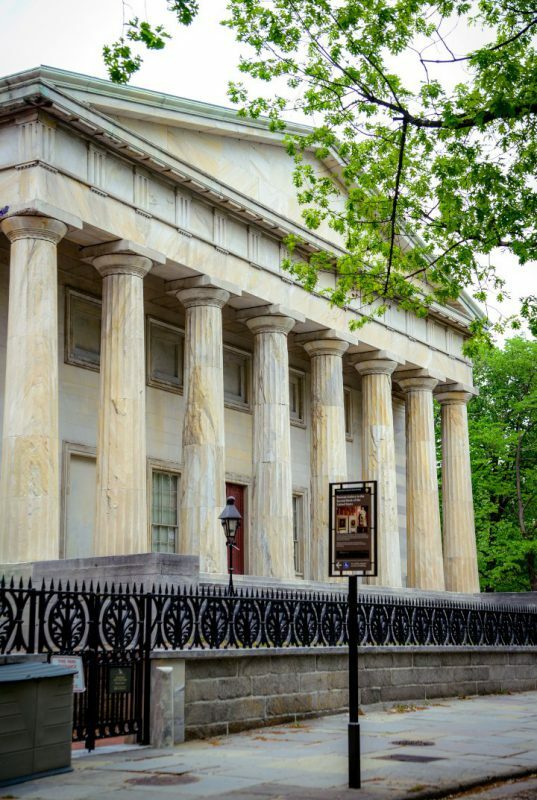 Modeled on the Parthenon, the Second Bank was regarded as the first truly Greek Revival building in the United States. On December 11, 1823, several of Philadelphia’s most prominent citizens met at the Masonic Hall on Chestnut Street to form a committee to help the Greeks. 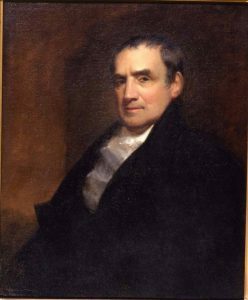 Foremost among them was Mathew Carey (1760-1839), an Irish immigrant and publisher, who was elected committee secretary. Having immigrated to the United States in 1784 after fleeing political and religious persecution in Ireland, Carey found a strong kinship with those fighting for freedom in Greece. Carey had long been active in charitable work in Philadelphia. 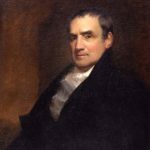 In the 1790s, he formed the Hibernian Society for the relief of Irish immigrants, and in 1829 he helped organize the Society for Bettering the Condition of the Poor. For the new committee to aid the Greeks, other members included Episcopal Bishop William White (1748-1836) as chairman; William Meredith (1799-1873), the president of Schuylkill Bank and future attorney general of Pennsylvania, as treasurer; Philadelphia Mayor Joseph Watson (1784-1841); George M. Dallas (1792-1864), future vice president of the United States under James K. Polk; Thomas M. Pettit (1797-1853), city solicitor and later deputy attorney general of Pennsylvania; prominent physician Nathaniel Chapman (1780-1853), future founding president of the American Medical Association; Nicholas Biddle (1786-1844), president of the Second Bank of the United States; local poet and playwright James N. Barker (1784-1858); and merchants and philanthropists Samuel Archer (1771-1839) and Paul Beck Jr. (1760-1844). Biddle had visited Greece in 1806, becoming only the second American to visit that country. He became a renowned patron and promoter of Greek culture and architecture in the United States. Similar committees formed in almost every region of the United States. New York was the leading center, coordinating the collection of funds throughout the nation. Philadelphia’s failure to surpass New York was the result of strong Quaker objections. With a number of individuals reluctant to support measures that promised to aid military operations in Greece, the Philadelphia committee chose to act independently. Despite Quaker opposition, Philadelphia nonetheless came in second to New York in the amount raised, contributing $3,900 in aid. A new relief campaign began in Philadelphia on December 16, 1826, after Carey became committee chairman. Instead of soliciting donations to support the Greek government’s military operations, Carey now sought to provide exclusively for the thousands of civilian refugees left homeless by the war and suffering from famine. Supporters no longer invoked the names of ancient philosophers or spoke of the past glories of Marathon and Thermopylae. The new emphasis on humanitarianism proved more successful among Philadelphians previously reluctant to finance the Greek war effort, which could be perceived as compromising U.S. neutrality. The campaign raised funds with several theatrical performances and special benefit concerts, and clergymen and politicians delivered fiery sermons and spirited panegyrics while they took up collections. Several other committees around Pennsylvania remitted contributions to the Philadelphia group, building to a total of nearly $23,700 in aid. Chester County sent donations totaling $3,362; Pittsburgh reported $1,800 in collections; Delaware County donated $485; Bucks County added $485; Lancaster contributed $350; York sent $432; Montgomery reported $400; and North Cumberland, $500. Philadelphia also received donations from outside the state, from such places as Spartansburg, South Carolina, and Greenville, Kentucky. The Philadelphia committee, like those in New York and Boston, purchased cargoes of food and clothing, which an American representative accompanied to Greece and distributed to the needy. 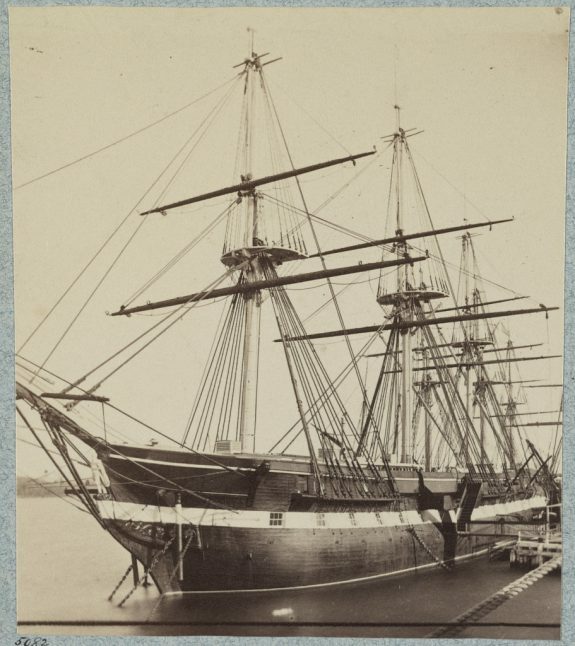 Philadelphians sponsored two cargo ships, the Tontine ($13,856.40) and Levant ($8,547.18). In all, philhellenes in the United States financed eight ships and cargo valued at under $138,000. Some of the cargo did not reach its intended recipients, however. The Greek provisional government wrote the Philadelphia committee in May 1827 to express its gratitude but also to request that some of the supplies be appropriated to the soldiery instead of noncombatants. When the Tontine arrived, Greek authorities seized its cargo. Afterward, the U.S. frigate Constitution arrived to ensure the safety of future cargoes. The incident involving the Tontine and reports of Greek piracy may have adversely affected future subscriptions. On April 2, 1828, the Philadelphia committee officially folded its operation. By then the revolution in Greece was coming to a close. The destruction of the Turkish navy at the Battle of Navarino in October 1827 by a combined British, French, and Russian fleet assured a Greek victory. In May 1832, Greece was formally recognized as an independent nation. But this did not mean that efforts to assist the Greeks came to an end. After the revolution, religious outreach programs continued. In 1830, at the insistence of Bishop William White, the Domestic and Foreign Missionary Society embarked on an ambitious plan to establish schools in Greece. By separating relief from the political and military affairs of Greece, supporters succeeded in linking their movement to broader patterns of benevolent, religious, and humanitarian interests during the 1820s. In these years an unprecedented number of Americans joined together in a far-flung network of benevolent, charitable, and religiously-oriented organizations that aimed to spread personal, intellectual, and moral improvement. Reformers embarked on an array of crusades. As these humanitarians began to address the social problems at home, they naturally became drawn to helping alleviate similar hardships overseas. The Greek campaign plunged American benevolence into the international arena. Angelo Repousis received his Ph.D. from Temple University and teaches there as an Adjunct Assistant Professor of History. Cline, Myrtle A. American Attitude Toward the Greek War for Independence, 1821-1828. Atlanta: Higgins-McArthur, 1930. Curti, Merle. American Philanthropy Abroad: A History. New Brunswick, N.J.: Rutgers University Press, 1963. Daniel, Robert L. American Philanthropy in the Near East, 1820-1960. Athens: Ohio University Press, 1970. Earle, Edward Mead. “American Interest in the Greek Cause, 1821-1827,” American Historical Review 33 (October 1927): 44-63. Repousis, Angelo. Greek-American Relations from Monroe to Truman. Kent, Ohio: Kent State University Press, 2013. ___________. “‘The Cause of the Greeks’: Philadelphia and the Greek War for Independence, 1821-1828.” Pennsylvania Magazine of History and Biography 123 (October1999): 333-63. Pappas, Paul Constantine. 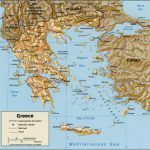 The United States and the Greek War for Independence, 1821-1828. Boulder, Colo.: East European Monographs, 1985. William Meredith Papers, Matthew Carey Papers, and Roberts Vaux Papers, Historical Society of Pennsylvania, 1300 Locust Street, Philadelphia. Second Bank of the United States, 420 Chestnut Street, Philadelphia.